Susan Walsh was Research Fellow in the School of Art, Design and Performing Arts, based at the Centre For Contemporary Art, although she is no longer involved. Her research Documenting Changing Britain : Shelter Below The Poverty Line is both location and studio based and incorporated her investigations into basic needs survival within ‘outsider’ communities such as, the homeless, migrants and roma travellers. One of her areas of research included creating of models/vehicles which could be used for shelter including adapting ready made objects and recycling materials. 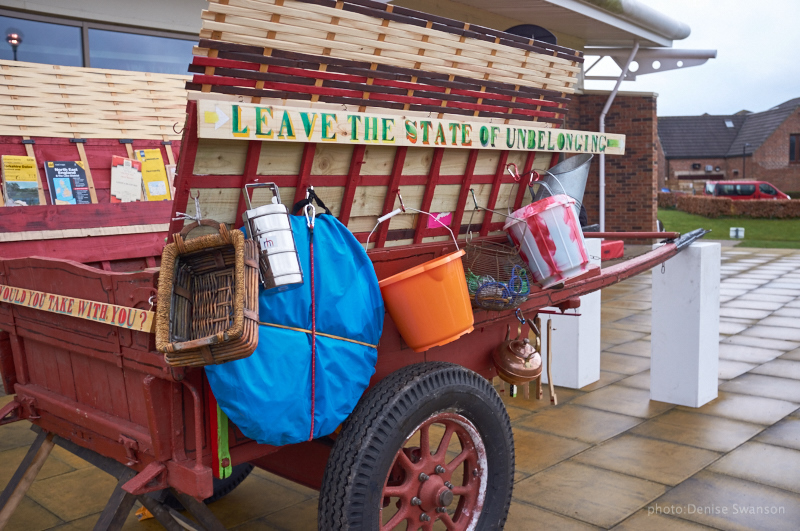 Satellite Navigation /CART in Durham A museum and site based project in which volunteers pulled a farm cart through both Preston and Durham loaded with objects essential for being on the move, this allowed questions to be raised around the invisibility of life in transit. Significant Other/Blue Plaques The English Heritage Blue Plaques make visible the efforts made by select members of society; based on this practice she created a series of ‘Alternative’ Blue Plaques placed in sheltered locations in Preston, showing some small acknowledgment of the way many homeless people exist and survive without permanent refuge in the 21st century. With Prof Lubaina Himid she co-directed the interdisciplinary visual art research project Making Histories Visible based at UCLan and contributed the show reel Images and Conversations from the 1980s to the exhibition Thin Black Line(s) at Tate Britain in 2011.